fun and educational project-based activities which encourage exploration, critical thinking and focus. What will our time at the Garden be like? Beautiful. Stimulating. Educational. 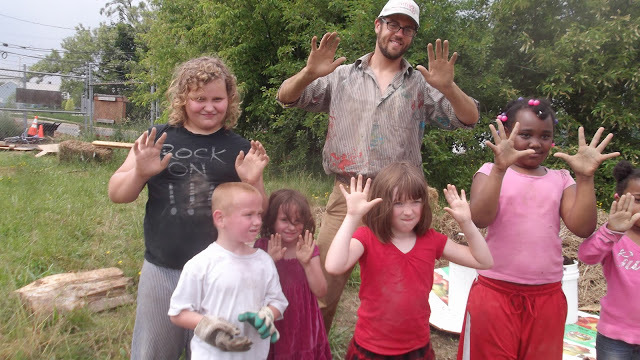 School gardens and community gardens are interspersed with orchards, fruit patches, meditation areas, art installations and demonstration areas. All of this is tied together by a self-guided nature path featuring signs made by students with the help of local experts. Specific programming is suited to fit your needs! 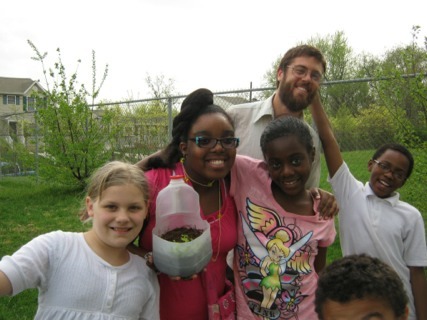 We offer service learning activities, hands-on curriculum which is aligned with the common-core and focuses on Environmental Literacy and STEM activities, and workshops on gardening, urban sustainability and cooking. We can also offer guided meditation and yoga workshops, and community arts tours of the surrounding neighborhood. When can we come out to the garden? The garden is open for you to come and look at Wednesday, Friday and Saturday, March-October, 10-4. Any dates outside of those availabilities, we appreciate a call or e-mail in advance. Unless there’s a scheduling conflict, the garden is always available for field trips, meetings, classes and workshops. Definitely bring comfortable outdoor clothing, a water bottle, and a hat or sunglasses. There aren’t restroom facilities on the property, though the school across the street is gracious enough to let us use their facilities. Bring a bag lunch, UNLESS you’d like to have a wood-fired cob-oven lunch workshop included in your visit. Let us know! 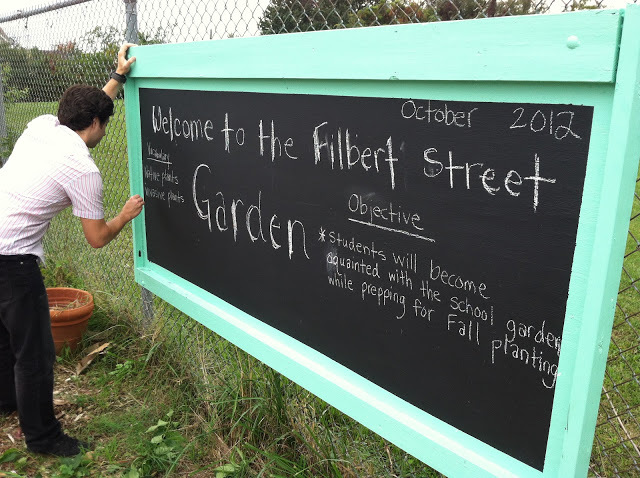 So wait, where exactly is the Filbert St. Garden? The garden is in Curtis Bay, in south Baltimore. Located next to the beautiful and historic Curtis Bay Water Tank and near Farring-Baybrook Park, the historic Polish Home Hall and 4 (!) schools. 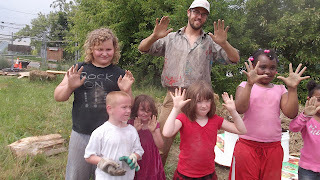 Filbert St. Community Garden is actively engaged in developing a strong community greening leadership. Through a program designed to integrate gardening, sustainability and stewardship into existing curriculums, Filbert St. Garden has engaged local schools through in-school field trips, Garden potlucks and concerts, workshops, school movie nights, harvest celebrations, and more. This Spring, the first Filbert St. Showcase Garden Grant give local schools and associations another way to get involved and help their community. 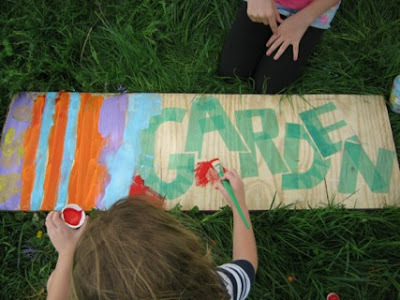 A "garden ownership"component which focuses on hands-on activities that revolve around a grade specific area in the garden. Chesapeake Center for Youth Development Building Trades Instructor Toma Solano has engaged his class in a "Green Building Trades Program". He and his class of local high-school students have designed and built a shed for the garden, built out of recycled doors and featuring a green roof. They have installed gates on our rowing area fence, and are currently designing and building a gravity irrigation system for the garden.